Live at the Barber Shop, audience || Photo Credit: Mike Lavin, @thehomelesspimp on Instagram. Sometimes The King’s College can feel like a pressure cooker for some. Approximately 600 motivated and driven students are packed into three floors of a New York City skyscraper in full business casual. Although the philosophical debates and Tocqueville's references are intellectually stimulating, how long has it been since you’ve given yourself a break to laugh? New York City is the epicenter of comedy. Comedians such as Fred Armisen, Jerry Seinfeld, Chris Rock, and dozens more have all started here in the Big Apple. 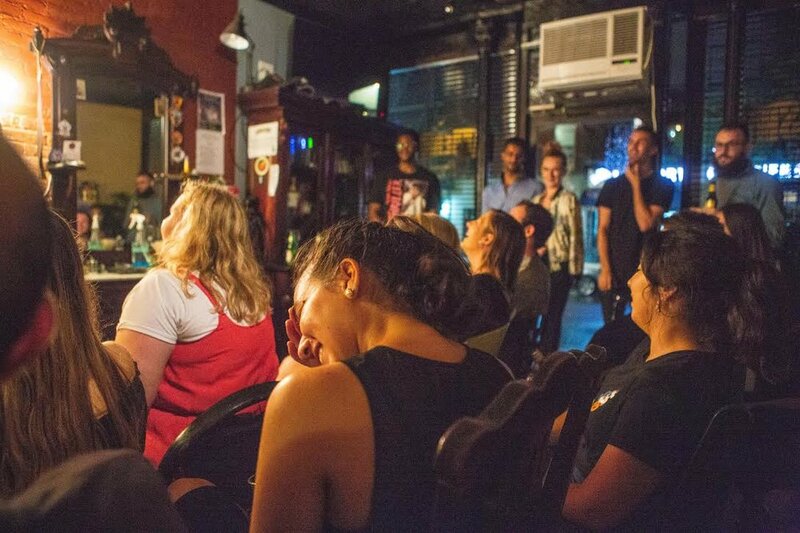 Give yourself a chance to experience all of New York City’s comedy scene on a budget with these NYC comedy clubs. This is a Latin vegan restaurant that doubles as a comedy club. St. Mark’s Place is a bizarre yet enchanting place. By day you can see NYU students grabbing bubble tea. By night, the streets are rowdy, bustling and are known for spots such as the Karaoke Bar, Barcade, and Two Bro’s Pizza. However, Thursday nights at 10:00 p.m. on St. Marks Place will soon change its reputation for having one of the best late night comedy shows in the LES. VSpot Organic is a latin vegan restaurant that doubles as a free comedy club every Thursday night. On those nights, you can see comedians flagging down people on the street:, shouting “Free comedy! Come in!”. While their advertising may be unorthodox, as soon as you sit down in the dimly lit back room of this vegan joint, there are no regrets. Barber shop during the day, comedy club on every Friday Night. Time: Doors open at 8 p.m., shows begins at 8:30 p.m., Ends at 10:00 p.m.
Venture into the East Village for a standup show put on by New York’s youngest up and coming comedian, Lev Fer. This 21-year-old comic has produced and organized Live at the Barber Shop for the past two years with good friend and comedian Ronnie Lordi. Together, Lordi and Fer have not only produced a consistently sold out comedy show but they also created a podcast, available on iTunes called Yung Daddy. There’s something magical about 30 people crowded into an old school barber shop in the LES every Friday night in the name of comedy. Although, the venue only holds up to 30 people, this intimate gathering can be heard down the block with its booming laughs from the audience. Note: Buy tickets in advance because the show almost always sells out. All photos taken by Mike Lavin, @thehomelesspimp on Instagram. Time: Fridays 8:00 p.m. - 10:00 p.m. & 10:00 p.m. - 12:00 a.m. Almost every night of the week you can find a free event to attend at Black Cat in the Lower East Side. The show was founded by Ryan Dacalos aka “Ry Daddy” and Aaron Cho (owner of Black Cat) in 2015. The owner of Black Cat, Aaron Ho, saw Ryan's success in producing other shows around town and asked him to start one at Black Cat LES. This is along with the social media promotion from Erik Bransteen. Danny Palmer took over the booking of the show in February 2018. They aim to book comics that kill onstage and succeed at doing so. On a typical Friday night during the summer, Black Cat is packed, holding anywhere between 80 -100 people in its small quarters. The vibe of this late night show is what makes it most appealing. Black Cat focuses on creating a vibrant scene which consists of the right lighting, music and people. Note: They don’t sell tickets. It's first come, first serve. To get the best seats in the house arrive fifteen minutes before, especially for the 10 p.m. show. Time: Every Thursday at 8 pm and on 3rd Saturday of every month at 9 p.m. There is not much better than free pizza and free comedy. Have a dinner and a show at my personal favorite, Bomb Shelter Comedy Club. In the basement of a bar in Midtown, this club has showcased comics such as Judah Friedlander (NBC 30 Rock), Mark Normand (Comedy Central), Annie Lederman (MTV), and Emma Willmann (HBO). Culture Trip named the Bomb Shelter as one of the best free comedy shows in Manhattan. Bransteen and co producer and comedian Matthew Azark started the show in April of 2016. Bransteen’s been featured by media giants such as Fox, Sirius Ex, Time Out NY, and CBS. Comedian, Jeff Cerulli's girlfriend Nikki Vargas came up with the name after noticing the basement “sort of looked like a Bomb Shelter. “, said Azark. “We are constantly trying to improve the show with seating, lighting, better air conditioning, etc. The room is a perfect place to see a comedy show since the ceiling is low and the audience is packed in tight. The set up helps keep the laughs in the room.” said Azark. Some clubs can cost as much as $50 to attend in the city, most with a drink minimum and you must be 21+ to even enter. Give yourself a break and a night devoted to some free laughs from talented comics here. Note: Come at least half an hour early. The club holds forty people and they consistently fill to max capacity each week. Tipping is encouraged. The comedians pay for the pizza and are working for free.